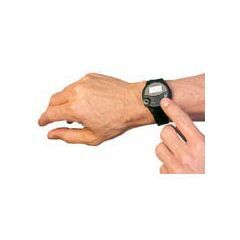 Easy-Set Talking Watch. A time piece for those who have trouble seeing a standard watch face. Designed with a special dial that allows audio time/alarm setting and prevents accidental reset. Also has an exceptionally large LCD readout and includes a long-life battery. One-year manufacturer's warranty. Not waterproof.